Well, I caved and joined Twitter. While I'm not really sold on it, as it is just a web page where people post stuff (not so glamorous now is it?) :) It does look like an interesting community tool though. I also have many things to write, which are not actually worthy of a full blog post. Fortresses in WAR are not very fun at the moment. They pretty much go down the same way every time with very little in the way of actually moving. I was thinking about this and came up with an idea that might improve the situation. It is likely not fun or feasible though. Fortress Zone. Mythic said, albeit it a while ago, that they were looking into making the fortress its own zone (loading screen). This should be done ASAP. If it is its own full zone, it can be much bigger. Having the fortress be bigger is essential. Objectives. There should objectives that can be captured by the invading force, similar to Battlefield Objectives. Once all are captured, the Fort Lord's room is opened. Respawn. 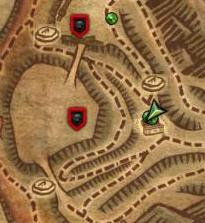 Most importantly, each side would be able to respawn inside the zone, until the Fort Lord is attackable. As a siege plays out now, defenders don't have much of a choice but to defend near the Fort Lord. This is because if their line breaks, it is game over... wherever they setup defense. Allowing respawns for most of the siege will encourage defense in other areas, since they will respawn and be able to get back in the action. This is basically turning the fortress siege into a pseudo-scenario. The door mechanics would remain pretty much the same. They are really just minor speed bumps anyhow. A bigger zone, with objectives and respawns should lead to a more mobile experience which would be more fun (maybe). So I decided to check out Free Realms. I'll have my actual thoughts on it soon, but first... Treasure Tickets! Who doesn't like treasure in ticket form? 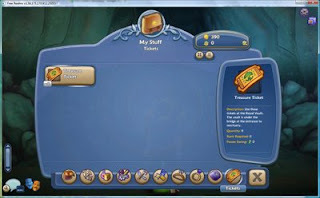 You gain Treasure Tickets by completing various goals in mini-games. For example, knocking out 12 blocks in the harvest mini-game will net you a ticket. So if you were wondering how to get them, so far it seems like you just play the games. You can see your tickets in your item sack, the last button is the ticket tab, so click on it. Now that you see your tickets, where do you redeem them? The description says Sanctuary... which is located in the middle of your map. If you look closely, you can see the arrow, there is also a little icon of a ticket on the map. Once you get there, be sure to check under the bridge! 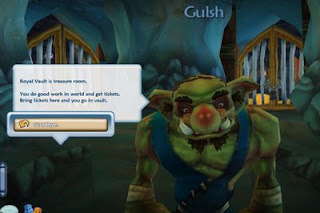 Once you find the cave, you're greeted with a troll. Ok, enough of this... onto the treasure! In the back you can see two gates, one of which should be clickable. Go click on it. 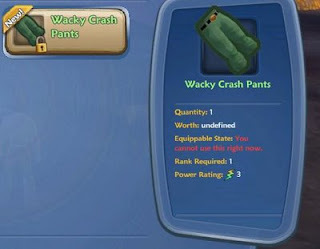 I got a pair of Wacky Crash Pants! Since I have no clue what they are, i checked my inventory under New Items. Have you heard about the new Winds of Change system Mythic is implementing? If not, you can check it out here. Basically, it is a bouncer. If a zone becomes too crowded and nears the point of crashing, the bouncer will eject people... starting with the undesirables. It's amazing how a video game can mirror the real world. In this case, undesirable would be dead or dying. Players are warned that the system is about to activate. Also, Mythic does state they anticipate this being a temporary system. I would say I am objective and optimistic as bloggers go. However, this change does not sit well with me at all. Mythic has been working on performance issues for months now, and this is their solution to buy themselves more time. What really worries me is how they arrived at this decision. They probably looked at the time/cost it would take to fix the problem and the time/cost to put in this Winds system. The core problem must be very serious if they are going to take the time to implement a new system. This just leads back the the main issue with WAR. It was not built to be an Open RvR game. WAR was mainly going to be an instanced PvP game, and it has shown that it works very well when doing that. This new system, the fortress caps, the city siege, are all really just moving it towards being pseudo-instanced. Mythic is in a bad spot here, so I understand why they have to put in this system. Sure, we'd all like to have the engine handle hundreds of players perfectly, but that is not reality and no amount of angry fist shaking will get it done. So what would you rather have, zone crashes or a bouncer? The Land of the Dead, RvR dungeon, is fast approaching. When it gets here, it will likely becomes WAR's new end game. That honor currently resides with the city siege, which is widely criticized. Why will the LotD become the new end game? Accessible. City sieges, on average, happen probably once a week for 2 hours. I have no data to back up the frequency and it varies on the server. They can last longer than 2 hours (the first stage), but our server never passes. The LotD will be accessible by one or both of the realms at all times. It will likely be a daily occurrence to fight in the LotD. Rewards. 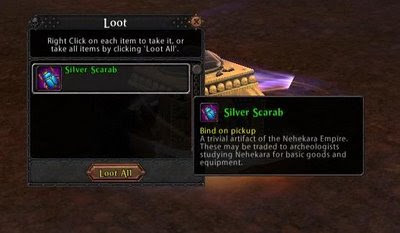 The token system in the LotD (silver, golden scarabs) will allow you to acquire equipment up to and equal to Warlord level. I'm going to make another baseless claim and say that most of WAR's population is still wearing some Annihilator gear. Even though the best equipment (Sovereign) will not be obtainable, many upgrades will be found for players here. Tokens can drop from everything in the LotD, so they will likely come at a faster pace than back in the old world. Also consider the Renown required for the Sovereign sets (70's). It won't be a concern for a lot of people. Fun. I don't know too many people who find the city siege fun. The LotD may turn out not to be fun either, but it hardly seems like it could be less fun than what we have now. Conflict of Interest. Locking zones is how you make it to the capital city. Now locking zones will also contribute to your taking control of the LotD. 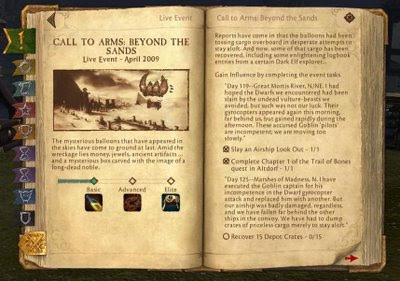 It seems likely that once access is obtained, most people will abandon the campaign and board the airships. Now the other side will reclaim the lost zones to gain access. Rinse and repeat. So we may not see any city captures for a while. That is probably a good thing as it will hopefully give Mythic some time to figure out what they want to do. Players will need a pretty good reason to go to the city rather than the LotD. 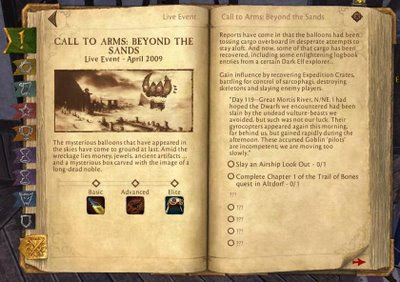 It has been a busy week for Warhammer Online due to the Beyond the Sands Live Event. I think this was a record amount of posts for me. So for Friday, I'll take it easy. Q: What did you think of Beyond the Sands? Overall, I thought it was one of the better live events. The Quests and story was engaging and there was plenty of RvR action. There are areas for improvement but nothing too major. Have you received your Aviator Goggles, Elite reward from the Beyond the Sands Live Event, yet? If so, you may be wondering what to use them for. Other than looking stylish of course. The tooltip says that the goggles let you see hidden Nehekaran treasure. The question is, is there treasure to be found in the game yet? The answer is yes! I thought the goggles would only be useful in the Land of the Dead, but I was wrong. 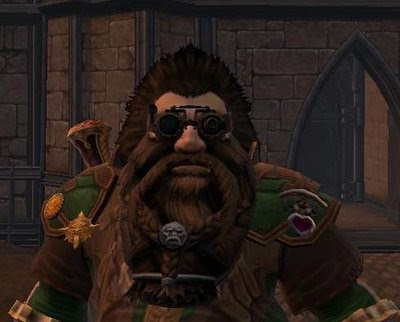 So to find the hidden treasure you put on the Aviator goggles and you should get the 'sight beyond sight' buff. Without the buff, the treasure will remain hidden. Next step is to run around and look for it. 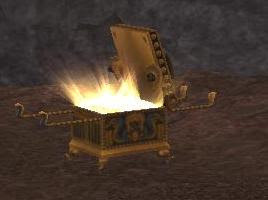 When you find a treasure chest, it will look like this. In order to open it, just use an attack. Once opened, it can be looted just like anything else. So far I have only found one item in it, a Silver Scarab. Seems like this may be a basic token for use in the Land of the Dead. I do wonder if there is a common (white) version though, as this says trivial, it seems not. Once you loot the chest, it does become visible for everyone to see. Many treasure hunters work alone and for good reason. 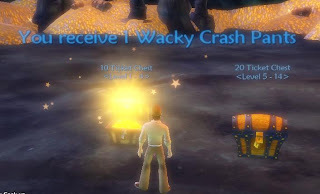 If you loot a chest in a group it will be rolled on. So you may want to consider that before you set out on your quest. Where can you find the treasure? This is hidden treasure.... I'm not going to come out and tell you exactly. I will tell you that I have found chests in tier 4 zones in the vicinity of the Fallen Kings PQ's. It could be in other places though. Mythic must of heard my wishes and here we have a RvR Boss Fight PQ, you're welcome. What do you mean they had to have it put together before my post this morning? So for you poor saps in an office, far away from your WAR client, here is the deal. It has 2 stages. The first stage is to get 2 artifacts to the Sarcophagus. There are 3 total, you can see them on the map. No, you can't pick it up and go hide in a BO or Keep. If you do, they will go back to their crates. Once you get 2 of the artifacts back to the Sarcophagus, you advance to Stage 2. The Liche Priest is a level 40 Hero who is none to pleased that we woke him up. Well that's just too bad, we want your bags! He has his own version of napalm, but it involves scarabs. The swarm consumed one of my allies... what a way to go. We got wiped on our first try. The 2nd attempt we did manage to defeat him, as we had a lot of healing. Overall the boss was not very hard. That is how it should be though, since most of the time your enemies will be lurking. 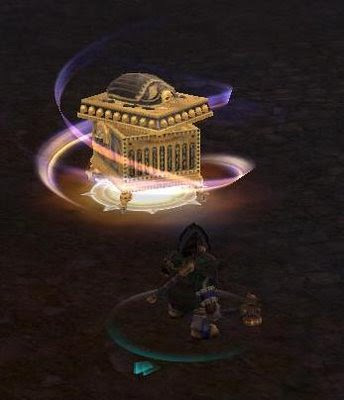 One important thing to remember: The PQ chest will spawn in your Warcamp, not on the scene. It was a fun fight, I am looking forward to playing it when more folks on both sides are around. Mythic has filled in all the pieces for Day 3, April 22nd. Fallen Kings PQ? Sounds like a boss fight, nice! Learn more about the Fallen Kings PQ here. Where have you been all my life? Seriously, the quests in Beyond the Sands have been a very nice addition. In prior events, the tasks were really just basic kill quests or go get X amount of this. Now we actually have a quest chain and other quests included. The rewards are good: gold and exp. The added story really adds some flavor to the live event. It all feels like it is leading up to something big. Mythic, I really hope there is a nice monster encounter at the end of this quest line. Back during the Halloween event, there was a big RvR boss fight that a lot of people enjoyed. 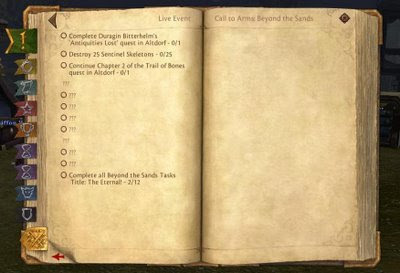 I hope we see something similar for the final days of beyond the Sands. Have you see the airships flying off in the distance? If not, try to look up every now and then, they are a pretty nice sight. So far, the RvR has been pretty good with the Live Event. It is really a simple formula if you think about it. Put something the players want in an RvR lake and they will fight over it. That's what I have been seeing so far and it's resulted is some fun fights. A diversion from the greater campaign is nice. WAR can be a frustrating game, mainly due to the population balance issues. You can see a good example of that here, where Destruction leads 10 servers to 3. That is all well and good, the real issue is the population swings that can occur. From my times on Averheim and Badlands, this is what I've seen for population imbalance. It seems that the population shifts towards whatever side is considered overpowered. It would certainly explain what is happening on Badlands. Order has disappeared and Destruction has re-appeared. Did they all go back to their main servers or in the case of Badlands, come home? Just like flavor of the month classes, in a PvP game people want to win and will play what side gives them the advantage. This is magnified in WAR as it only has 2 sides. There are only two states, winning or losing. There is no in between. In Eve or Darkfall, there are a huge number of sides that may not be involved in your war. It would be really nice to reach some sort of equilibrium in WAR. I'm not sure it is possible, because if all things were equal we would be in a stalemate. Rather then that, I would just like to see less extreme population shifts when a new patch comes around. The crates don't seem to do much yet, other than disappear. Also the monsters that guard them in some cases do not agress... so they are easy pickings. Beyond the Sands has begun! Here is the task list for Day 1, April 20th. Hidden Treasure? Count me in! Mythic released a new video about the Land of the Dead, this time it is full of juicy details (thanks Tok!) Since it's Monday, let's get right down to it. If you want to watch the full video, it can be found here. Expedition. 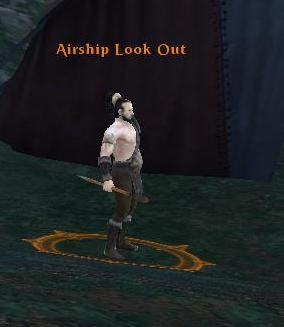 Since the Land of the Dead is pretty far away, we'll have to take airships. These airships are not cheap and require a significant amount of resources. Once a side gathers enough resources, they are able to go to the zone. These resources are made up of Tier 4 Zone Control and player kills. A short time later. Once access is unlocked, all resource gathering stops for 30 minutes. This is the time the 'victors' get to be in the Land of the Dead alone. Once the 30 minutes is up, the victor resource gathering is reset and the other realm's goes on from where it left off. This should result in them gaining access to the Land of the Dead soon after. The Binge. 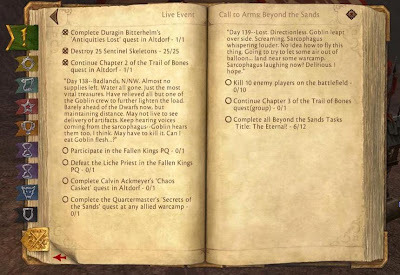 There are about 36 Public Quests (18 on each realms side). According to the video, they all contain different mechanics, so should be pretty varied. Every PQ is also Solo friendly. There are also tougher group targeted enemies lurking around too. Everything in the zone has a chance to drop tokens. Tokens. 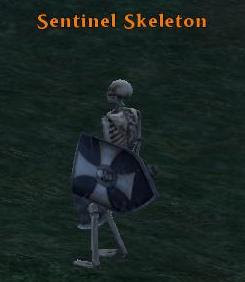 They can drop from everything, including players and npc's here in the Necropolis. They can be exchanged for gear whose upper power limits are comparable to Warlord. Lairs. There will be several instanced lairs. Entrance is gained by getting glyphs from the PQ's. These glyphs will remain in your Tome of Knowledge until you defeat the lair. You should also know that these instances are not safe from your enemies. They can enter them at any time as well. The Purge. When the opposing realm gains control, you will no longer be able to respawn in the LotD. You'll likely to be able to rez, but without a respawn the former realm will slowly be evicted from the area. 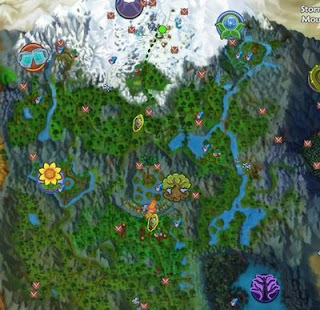 The invading side will be given quests to clear the battlefield of the opposing realm up to (and including it looks like) their camp. This video has me pretty excited for June... we just have to get through May. I would love to see some LotD game footage soon too. We have not even gotten to the pyramid (Tomb of the Vulture Lord) yet. 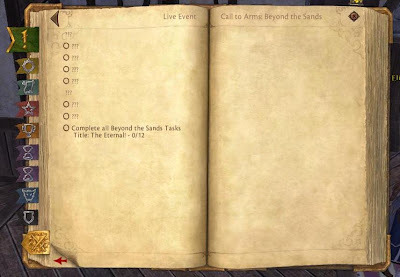 Did you know that the latest Live Event for WAR, Beyond the Sands , starts today? Mythic released the 1.2.1 patch yesterday for WAR. Along with balance and bug fixes, this patch introduced the Keep Upgrade system and the RvR Token system. It looks like WAR had a typical bad patch day, but I was one of the lucky ones, who had no problems. I logged in to find that Destruction had already locked Praag and Dragonwake. So it was off to Reikland to fight. Wouldn't you know it, I had a very good time. When I arrived, Order was trying to lock the zone while fighting off a nice sized force of Destruction. We eventually succeeded and locked the zone... which marked the end of my playtime. For the first time in months, I actually felt like I accomplished something with the time spent in game. That right there makes the token system a success for me. My playtime was a little less than an hour and I was in a full warband but I walked away with 8 Officer medallions and 1 Conqueror Crest (which can be broken down into 5 Officer medallions). Sure, I have a long way to go before I can buy a piece of Conqueror gear, but that isn't the point. For once I am working towards something where as before I really had no chance at obtaining that gear. During a fight with PRX, one of them dropped a Warlord Crest. Sadly, I did not win that one. The graphics seemed very crisp, as did the animations. The new Guild menu is a huge improvement too. There is still a lot Mythic needs to do for WAR. The whole city siege needs to be looked at and improved. While the end-game is uninteresting, any improvements like 1.2.1 will just be a temporary boost. Land of the Dead will certainly help, but it too needs a healthy city siege to succeed. Devour Essence: This ability will now properly heal the target buffed with the spell. Seems like a good change, I know my turret was pretty fragile. While Lions have always asked for tougher pets, as part of their DPS comes from it. Fixed an issue with several Chalices and Books that was causing them to produce far more Soul Essence than the tooltip stated. Will this reduce the healing of WP's and DoK's? Don't get me wrong, I like me some healing, but they were dominating. Flurry/Lotsa Choppin': These abilities have been changed to a Cone area of effect that will only hit targets in front and on the sides of the character. Due to this change the abilities will no longer require a target to activate. Players operating a Ram will now be immune to Knockback and receive reduced damage from Oil Siege Weapons. I guess this is ok... I did enjoy knocking them off the ram. I wonder if Knockdowns will still work? Dropping a land mine near the ram was always fun. I'm not sure how much it helped the cause, but it was enjoyable. Siege Rams will now do twice the damage as they previously did. Keep doors will now have double the hit points they previously had. These are some pretty big changes to the Keep Siege system. I think they are a step in the right direction. Before this, the ram was just something that was nice to have. Most of the time, players DPS was sufficient to take down a door. Now a ram will be more of a necessity. When combined with Keep Upgrades, I think sieging will be a bit more interesting. We just need to get rid of siege pads and add in breakable walls. We have significantly increased the hit points of Ram Siege Pads. Caltrops and Dynamite will no longer be introduced with the Ordnance system. If they weren't working out, they should be held off. It was a nice idea... but did they really add anything to the game? Sounds like 1.2.1's release date is getting close. While this patch alone will not do too much for me it is a nice step towards 1.3. Over on the Warhammer Herald, a new Dev Diary was released about the upcoming Land of the Dead Live Expansion. It is a pretty nice read as it gives some insight into what Mythic wants with this new experience. Expedition Resource System. This is something new , at least to me. In the context, it could mean that in order to enter the RvR dungeon, a certain number of resources must be collected. Zone capture and world RvR kills are mentioned as a part of the system. Anything that encourages players to fight sounds good to me. There is likely a missing piece here, as I doubt too many of the opposing side will be hanging outside the dungeon once they get access. Theme. It seems the Land of the Dead theme was one of many they were considering. I think they made the right choice. I like the setting of the campaign, but I would like to see some different visuals. An Egyptian-like setting should look amazing. Indiana Jones. Anything is influenced by Indiana Jones is a step in the right direction for me. Traps. In addition to a swinging pendulum, spitting darts are also mentioned. I am really curious to see how traps will work with the whole Purge mechanic. Instances. Not even instances will be safe from the enemy. That should lead to some very interesting stand-offs. I can imagine a wayward AoE aggro'ing the boss and all hell breaking loose. It is really looking good. June is fast approaching, so I really hope we see more articles and teasers. With as large as the zone and dungeon is, we should be able to get weekly sneak-peaks or other features to raise the excitement level. I have been playing Resistance 2 on my PS3 lately. It is my only PS3 game, so I figured it was finally time to give it a whirl. It's actually pretty fun. 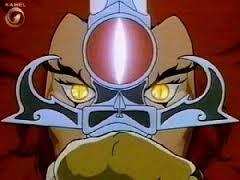 The weapons, with their dual functions, are all pretty nice. Graphics wise, it is top notch. The scale of the game, from the landscape to the monsters themselves, is impressive. Why does it seems aliens are always monsters? Resistance is pretty standard in the monster alien department. Halo's Covenant was a nice change of pace, but the flood were really just monsters. I would really like to find some non-disgusting technological aliens for once. A FPS doesn't have to also be a horror game... as COD shows. Whatever happened to Lions, Tigers and Bears... oh my? It seems in these games, everything on Earth is always weak. We and the other predators are pretty much perfectly adapted to this world.... I'd love to see aliens have some disadvantage. Instead, they have a monster for every situation. Super unkillable water creature? Check. Zombies for the dark, check. Nasty spider like creatures? Can't go without them.... Invisible guys? Che... Where did they go? After resistance, I am thinking Killzone 2. I hear that is pretty good. It is Spring time here and the weather is starting to get warmer. Much like the seasons, my MMO interests change. Let's take a look at this months forecast. Champions Online. Superhero's, Character Customization and more action oriented combat are all very high on my interest list these days. With CO slated to come out relatively soon, I just can't get enough information about it. 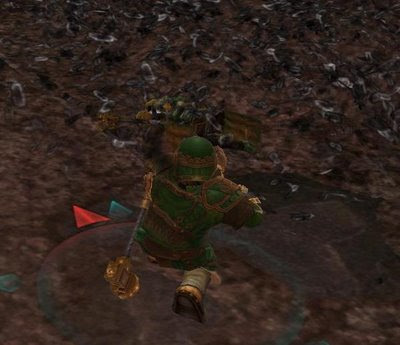 Warhammer Online. Although I haven't been writing about it as much, I am still very interested in WAR. With the large 1.2.1 patch coming out and the Land of the Dead ramping up for early this summer, things are looking pretty good. Eve Online. I have actually been playing Eve the most over the past few weeks. Even so, it is a tough game to stick with, as it really feels like work sometimes. I'm not sure how long I will be able to keep playing, but right now it is fun. Star Trek Online. I am a big Trek fan, so I am eagerly awaiting this MMO. If we were anywhere near its release, it would be HOT. Based on the information we have been getting about the game, it appears we still have quite a bit of time to go. Star Wars: The Old Republic. This one is bordering between warm and chilly. I like Bioware and I like Star Wars. However, they have released so little gameplay information that it is hard to get excited. World of Warcraft. I have not been playing WoW much lately. My character is sitting at 79 and I do not have any real motivation to continue. The raiding life just isn't for me. The upcoming 3.1 patch looks very good, but really it doesn't give me a reason to play. Star Wars Galaxies. SWG is another game I want to like. I love many of the game systems (housing, Beast Master, Space). The dev crew there has been putting out some nice updates too. The game just feels too old and the community just isn't there. Lord of the Rings. LOTR is another game I've dabbled with. If I had more time, I may actually play it a bit more. However it really falls too close to WoW. I'm not going to be a raider, so really what is the point? Darkfall. DF is an interesting game. Due to the fact there has been no North American release and it is so hard to even get an account, it has to fall under cold. If it were more established, I may give it a try. In the mean time, I do enjoy reading about the game over at Syncaine and Keen. Chronicles of Spellborn. As I wrote here, there is just nothing about this game that really sets it apart from the pack. Ryzom. Interesting game but just too much in flux and dated for me. There are many more games out there and on the horizon, but these are the ones that have caught my attention recently. A fierce warrior up for any challenge, you will never back down from a fight. You are an honorable combatant, but that does not mean you are above deriving pleasure from the defeat of your adversaries. With the possible release of Champions Online coming in the next few months, I have started to follow it a bit more. I never played City of Heroes too much, as I caught on to it late in the game. With Champions on the horizon, I always figured I should just wait for it. Now that it is almost here, there are 3 things I am expecting. Character Customization. Since Cryptic also made City of Heroes, the character creation in CO should be as least as good. That is a great start because you could really go wild and make the kind of character you wanted. Powersets are also losing their restrictions in CO, so you can mix and match as you please. It is looking very good on this front. Throw Stuff. Pretty simple, I want to throw my enemies around and throw stuff at them. For some reason, I have always enjoyed throwing stuff around in video games. Knockbacks are a lot of fun in WAR and other games. If we can add in the ability to toss a car or rock at your enemy, all the better. Casual. If I play casually, will that mean I play alone? I really hope not. In City of Heroes, there was a sidekick system that let you play with people +/- 5 (maybe 10) levels without a penalty. I would love to see this expanded a bit more for CO. From what I've read, it looks like CO will have such a system. So those are the 3 things I want from Champions Online. Nothing too fancy or crazy. Late last week, Mythic gave us some details on their new token system. This is similar to badges in WoW and other bartering (token) systems. 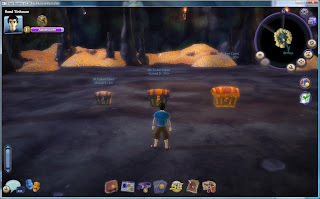 Medallions are loot, which are rolled on, and can be traded in for items at a npc. They are bound to you though, so no giving them to another player or alt. I am pretty excited about seeing this system come to WAR. One thing that the game has been missing is any sort of progression to the next set of armor. I can't remember the last time I got a new piece of armor (that I didn't buy). Tirew is wearing 2 Conqueror pieces and 3 Annihilator still. The odds of me getting any Fortress rewards or City PQ rewards have been very slim. Now, I can start to work towards those by just participating. ANY player who participates in a keep capture will be rewarded 2 common medallions appropriate for that tier content. Did you ever get that deja vu feeling? The easiest way to get medallions will be to take an undefended keep. This will just encourage keep swapping, just like influence did. Players should be rewarded, but why 2? One medallion would be more appropriate. Zone capture does give players who participated in the siege medallions too. So why should the undefended keep swapping give better rewards than a zone capture? Crests (higher level medallions) are also rewarded on city siege PQ completion. If there is a mostly empty instance, the players will pretty much farm all the crests they will need for a piece of gear in 1 shot. Again it seems like avoiding combat is being rewarded. Another questions is how will this system work with the Land of the Dead? I am going to bet that it will have it's own version of this token system. Overall, I am happy to see a token system. It should add a lot to WAR and make the end game a bit more interesting for many players. At present though, it seems like there are too many rewards for not fighting players. Please Mythic, reward fighting players, not npc's. Have you dreamed of being like Syp? Do you sit around thinking, "Man, I wish I was Keen"? Do you have a pent up rant that you must get out? You too can be like Hudson and release it upon the world. The folks behind MMO Guildsites have created another site for MMO blogs, MMO Fansites. Why use them instead of Blogger/Wordpress? 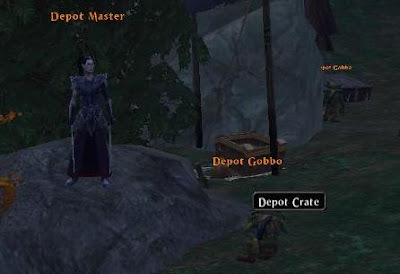 They offer most of the same services, but they are also a community dedicated to MMO's. Easy to enable gaming plugins, such as wowhead and wardb, which isn't possible on blogger or the hosted wordpress without code editing. Detailed theming and layout tools which are quite different from blogger or wordpress. The homepage listings, which can help drive traffic and currently includes recent posts, a featured post and blog, and recent tags. The option to email them if you want a feature, which they will likely try to include. As Werit approaches 200 RSS readers (yay! ), I have been thinking about what I should do with the site. One thought is to get a domain name, so it would be http://www.weritsomething.com. What do you guys think about that? Are there any real pro's or con's to going with a domain name? The patch notes for 1.2.1 were released yesterday. Earlier in the week Mark had given us a preview of what was to come, but he did not mention everything. I was pleasantly surprised to see a lot more changes than I expected. Secondary Stats. While this may not be for 1.2.1, it is being tried out on the PTS. Some of the lesser used stats have gotten improvements. For example, Willpower now Increases your Magic Critical bonus damage dealt, and also increases the effectiveness of Healing Criticals from your healing abilities. I am pretty much for anything that adds variety and player customization to the game. New Guild Page. This change has been a long time coming. The Guild page was very archaic. With 1.2.1 it has been given an overhaul. Among other things, this caught my eye: Added more guild statistics to the profile page. Keep name and upkeep cost, personal renown and tithe contributed. Finally! I really hope it will at least tell you how the keep is benefiting your guild. Escape! Pre-game splash screens and opening cinematic can now be skipped by hitting the ESC key. Another small but very nice change. What's the door at? Keep doors and other attackable objects will now display their health. No more needing a mod, so long as you can see the door. Scenario fixes. A number of scenarios have had their points adjusted and spawn camp defenses added. With Open RvR alive and well, I rarely do scenarios anymore. Still, nice to see changes. New items? You may now occasionally discover items that can be traded to other players, but cannot be put on to the Auction House. Not sure what this means, but I look forward to finding out. City Scenarios. It seems all will be able to participate in the city siege, as the scenario will be for non-T4 ranks. They will be bolstered to an equal level. This sounds like a good idea, as it will get everyone involved. I never bother with the scenario, as I am too focused on the siege game. Easier looting. I had always wondered why looting felt more difficult in WAR, now we have the answer: The game client will now prioritize corpses with loot on them over empty corpses. As a result, players will now be able to more easily loot items from piles of corpses. Style and Profile. You can now tie all your settings to a character profile. This will be very helpful if you have different settings for different characters. Not an April Fools joke either as I am downloading the huge patch as I write this. The amount of changes in here are pretty staggering. I would post them here, but go check it out. All you need to do is start-up testpatch.exe in your WAR directory. The more testers the better.